Tin boats are magical toys. They were once manufactured to strike the imagination of the children, but their charm holds a nostalgic power, that keeps many adult busy collecting them. Their appearance and development coincides with the era of great ocean liners and battleships from late 19th to mid 20th centuries. 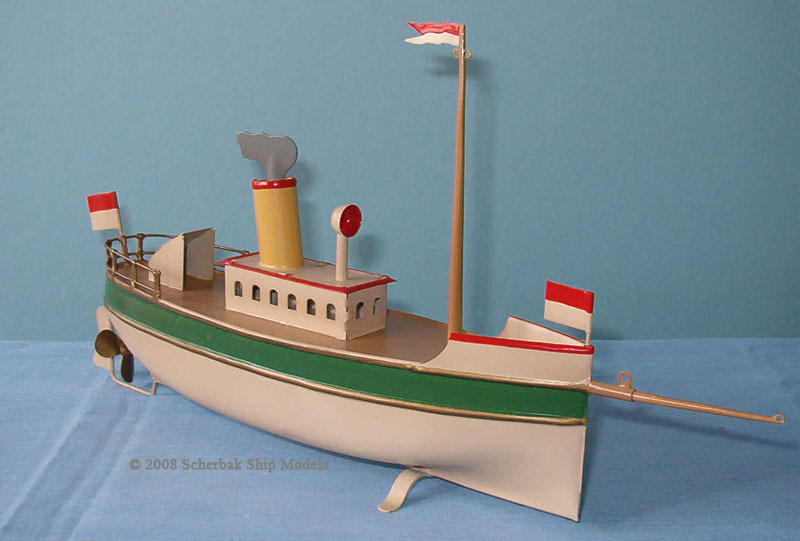 The toy ship market of this time was dominated by German makers such as Marklin (Märklin), Bing, Carette, Fleischmann, Arnold, Falk, Plank etc. They manufactured whole a range of magnificent ocean liners, battleships, riverboats, pleasure yachts, gun boats and submarines which could realistically float and move in the water with their miniature wind up or steam powered motors. Boats were fantastically designed to be played with, often with oversized moving parts ( guns, anchors, life boats, steering wheels), emphasized masts and flags, attractively painted, often accompanied with brave tin sailors … No wonder they were remarkably desirable toys to those fortunate children whose parents could afford them, no wonder they remain a most wanted collector’s items today. Pictures on this page show some charming tin boats from our collection or that were sold to our customers. 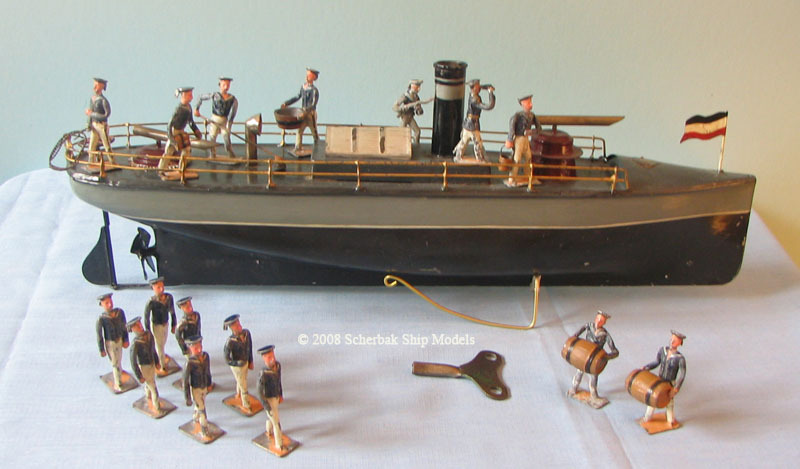 See antique toy boats and nautical toys offered for sale in our "Antique Toy Boats" section . © 2009 Scherbak Ship Models. All rights for text and pictures reserved.